Students in the American Diploma Program (ADP) are subject to Continual Assessment (CA) and Quarter Exams. Each subject teacher assesses the students’ academic achievement through homework, class work, quizzes, projects and quarterly exams. School assessment accounts for 40% of the Diploma, and 60% is externally assessed through the Scholastic Aptitude Test (SAT 1) (applicable to Grades 10, 11, 12) - see table below. 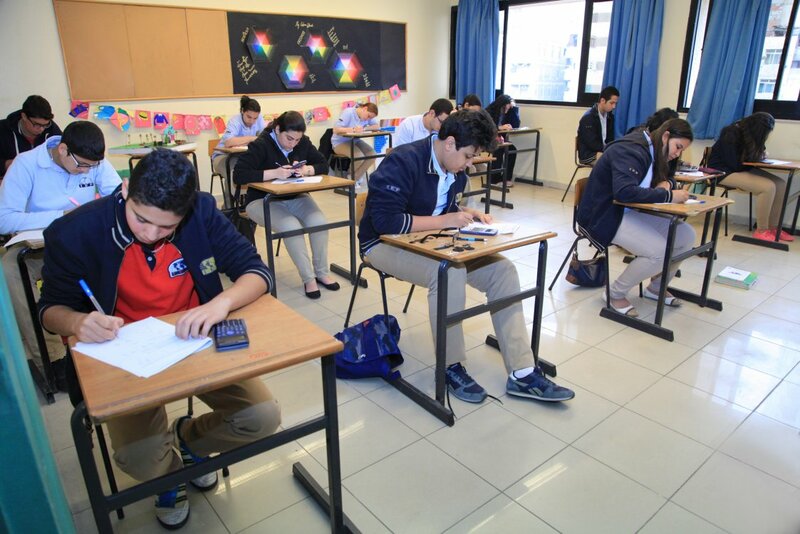 A second external assessment, the Subject Aptitude Test (SAT 2) is completed during Grades 11 & 12 and is worth an additional 15%. Attendance is essential for the successful completion of the Diploma. Students must not be absent for more than 18 days (10 % of the school year). Students must ensure that any work missed due to absence is caught – up; otherwise, the Quarterly grade will be affected. Students follow a Program-designed curriculum offering a selection of twenty subjects. (See table below). The number indicates the credits the subject is worth. Students require a minimum of 24 credits for Graduation. In each year (grades 7 – 12), students take eight subjects (including the core subjects of English, Maths, Science and Foreign Language). The school week also includes Activity Lessons where students have the chance to develop additional skills. Students and their teachers agree on a formal Discipline Code (DC) at the beginning of the year; the code displayed in classrooms to remind students, when necessary, of the behavior expected of them. School premises: Students are not to leave school premises at any time without a written permission from the school administration. School property must be kept clean at all times (no littering etc). Language: Except during the National Studies, Arabic, Religion and Foreign Language classes, English should be the language of communication and study. A standardized Grading Scale (See table below) is used by all Subject Teachers to assess students' performance by grade /Percentage/equivalent GPA. The ADP believes that effective learning occurs in an atmosphere of academic honesty in which students have developed a high sense of responsibility. This is accomplished through the cooperative efforts of parents, students and teachers. Although the society we live in places pressure on the students to excel, the ADP will not tolerate nor condone academic dishonesty. Students can only receive marks and grades that reflect their academic standard/achievement. The administration will not negotiate marks with parents or students under any circumstances. ADP offers a safe and secure learning environment; where students feel able to express themselves and in turn reach their potential. The ADP place great emphasis on the importance of the learning environment, whether it is the classroom, the library, multi-media-lab, or the physical education / recreational areas. Where appropriate, and with suitable guidance, we encourage students to contribute to these environments to make them their own. Teaching staff will stimulate their learners using interactive materials and resources. All teaching rooms are equipped with interactive smart boards which enhance the students' learning performance. We hope that you will see your own child’s personality and performance expressed within these spaces, through displays of work and other forms of creativity. Mobile phones are not permitted in school; students MUST HAND IN THE MOBILES TO THEIR FORM TEACHER AT THE BEGINNING OF THE DAY AND RECEIVE IT AT THE END OF THE DAY. Parent- Teacher meetings are essential to review students' progress. Meetings are held according to the Academic year calendar of events to discuss students' Quarterly Reports. Parents with further concerns are welcome to consult with teachers during the year; however, parents are kindly asked to take an appointment from the Program Office first. A Progress Report is issued indicating students' achievement and work habits before quarter exams. A Report Card providing qualitative/quantitative data is issued at the end of each Quarter. Parents should review, sign it and discuss their child’s performance with the teachers. We look for every possible opportunity to reward excellent student behavior and performance. We are aware that students develop at different rates, so ADP acknowledges progress of different levels. We operate a ‘progression’ reward system, explained to students at the beginning of the year. Students must wear full School uniform at all times. Boys must have shaved beard. Students are not allowed to wear jewellery, accessories or make- up to school.